The development of your child’s teeth, gums and jaw structure is an amazing process. But while it largely occurs on its own, we can’t take it for granted—we’ll need to do our part to ensure their mouth stays free from the effects of disease and injury. That starts first and foremost with early oral hygiene practices. And we do mean early, even before teeth begin to erupt: a simple habit of wiping their gums after feeding with a clean, damp cloth helps reduce the growth of bacteria, the leading cause of dental disease. Once teeth do appear, you can begin brushing them every day with just a smear of toothpaste. You can increase this to a pea-sized dose around age 2, as well as begin teaching them to brush and later floss for themselves. Regular dental visits are the next pillar of preventive care. By and large it’s best to begin visits around their first birthday. Their primary teeth should be coming in at an even pace by then; and the earlier you begin visits the easier it will be for them to become used to them as a routine part of life. Dental visits are essential for keeping bacterial plaque under control, as well as monitoring overall dental health. It’s also an opportunity to apply other preventive measures such as sealants that discourage tooth decay development on biting surfaces and topical fluoride for strengthening enamel. 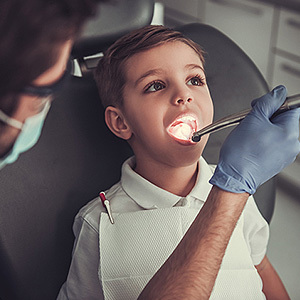 Dental visits also provide frequent opportunities to detect bite problems or other situations as they’re emerging. Recognizing these early gives us a chance to intervene with less invasive treatments that could prevent or minimize more invasive treatments later. You also don’t want to forget about the other major cause of dental problems—traumatic injuries. You can lessen this risk by limiting your child’s exposure to hard, sharp objects like furniture or some toys. And if they become involved with contact sports, it’s a good idea to invest in a custom mouthguard to protect their teeth and mouth from blunt force trauma. As always, we’re here to support you and give you advice on other ways to keep your child’s dental development on track. Together we’ll give your child the best chance possible to enter adulthood with a healthy mouth.